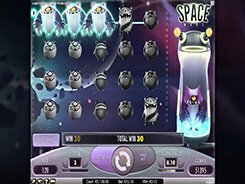 Space Wars is an alien-themed video slot equipped with 5 reels that are arranged in 4 rows, and the reels are populated with strange-looking aliens of various shapes, colors and sizes. 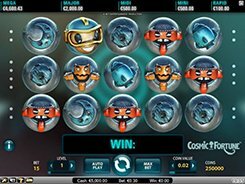 The slot is played over 40 fixed paylines, so you can adjust only a coin size and the number of coins per line, and place your bet anywhere from $0.4 to $200 per spin. Space Wars has a wild symbol that appears on reels 2 and 4, and replaces for other regular symbols. 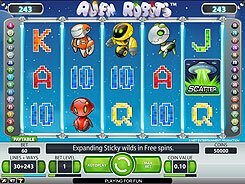 Besides, hitting a winning combination activates one respin at no extra cost. 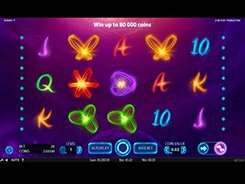 The symbols that formed a winning combo in the triggering game will be predominant symbols during the respin. 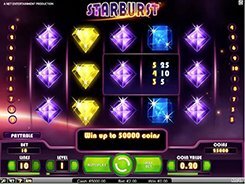 The largest jackpot prize up for grabs in the slot is x1000 times a line bet (or $5000 if betting max); this is awarded for hitting five Red Crystal symbols on an active payline. 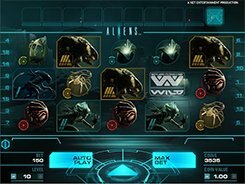 There are no scatters or free spins in Space Wars, but it is offset by a lucrative Respin feature and frequent wins that all make the slot very attractive for every slot fan.